Emily slept for 3 hours on the way and was so happy last night! ﻿﻿ So, we made it to New Jersey on Sunday evening. We ended up leaving later than we had planned to leave on Sunday and then half an hour into our ride, we realized we left our gift cards at home, and had to turn around and get them. We ended up making it to New Jersey to the campground by 7PM. We get to the campground and I run inside to get the site and pay and was shocked when she said your friend took care of it in full. I was like, what who? So a huge Thank you goes out to Sue for taking care of our week here at the campground. It means so much! We miss the girls already, Jessie is with her dad and Brianna is with my parents. So we are missing them already! Also it snowed in VA (and we never get snow) and no snow here in Jersey/Philly area. Both of the girls got to have some snow time. Here we are, it is Monday night at 250AM, and I have worked for the night...Emily and Doug are both asleep and here I am awake, wide awake (which is weird for me when not being in the hospital with Emily)...Emily had a visit today at CHOP for a consulation on the broviac removal / port insertion and with Anesthesia Resource Center and then the MIBG Injection. Emily doesn't really know that she will have the broviac removed and the port placed, but I somewhat think she does. We haven't talked much about it, mainly because she will get anxiety about the surgery! We are both nervous about this, obviously because of surgery but also just because of how Emily will be when it has to be accessed. While the best part of it will be, she will not have to have dressing changes and will be able to go swimming and go to school and not worry about her line being pulled. 14 months of not being able to go all the way under water, it will definitly be different. Dr Mattei did indicate that it will be sore for a few days, but then after that she would be fine. Our hope is to sometime take the girls to Great Wolf Lodge in Williamsburg, VA and let them all have a blast. After we left the hospital we came back and let Emily feed the ducks, she was a bit nervous about it, afraid they would follow her, but mainly watched us feed the ducks. She has been very irritable lately and gets upset easily! Its heartbreaking to see her cry so easily over something that we would not have imagined her to cry about or that she wouldn't have cried about just 2 short weeks ago. Today while waiting for the MIBG Injection she wanted to play with a little girl, well the little girl left and went back to her mom and Emily cried, and it came out of nowhere and Doug picked her up and tried to get her mind off of it. The little girl realized it and then asked Emily to come and play and then Emily was fine. It was heartbreaking to watch your own child cry about her feelings being hurt! She still comments about pain in her hip when you touch it, but is walking/running around with no problem. Tomomorrow is MIBG day, Emily will have her scan at 10AM, and I am beyond nervous and scared about this day and I know Doug is too! Emily will rock it, like she always does and be such a big girl and sit still so she does not have to have the "white stuff". I have some major scanxiety going on right now but still trying to keep up the hope, Im thinking that is why I am still awake, because my mind won't shut off! The hardest part is also not knowing what is coming next, what the treatment looks like or anything and where tomorrow will bring us. Please send us lots of love, thoughts and "HOPE" as we go through these next few days. A big huge thank you to Burkeville Baptist Church for putting on a fundraiser for our family and to all of our family and friends who were part of such an amazing event. We have no idea what this next year will bring us with treatment, but as long as all of our family is together is all that matters. Jessie and Brianna, I miss and love you girls both so much! Hope you both have a good week! Make sure you hug and kiss your kids good night and tell them how much you love them!! There is a fundraiser that is happening Saturday night that Burkeville Baptist Church is putting on Saturday night, and for the fundraiser, I have made a slideshow about our Emily! Enjoy, let me know what you think! February 12: Tomorrow Emily has clinic. We are thinking that her hemoglobin is low because she has had a lot more downs than ups the past two days. Just very low energy and tired and clingy to mommy! We also have 1 week from today before we head to Philly and we prepare for a week of scans, with surgery to remove hickman line and replace it with the port and also a bone marrow biopsy. February 13 @ 1230PM: Emily is still here at the clinic saying she is tired! It will be a long day here because Emily needs a blood transfusion! Platelets went to 59, small increase but better than decrease! ANC is still a little low but ok! Have a good day! 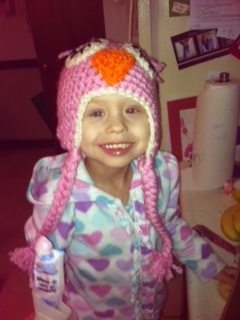 February 13 @ 8PM: Emily received her "super blood" (blood transfusion) and has much more energy! It was a long day at the clinic. Emily has been complaining of pain here and there, but we are hoping it is nothing! Over the weekend, Emily had a lot of ups and downs and she was pale a lot over the weekend. We could really tell Saturday night, that she just wasn't normal, so we figured her hemoglobin must have been low. We thought we might be taking her to the ER to get a transfusion if it has gotten any worse. Sunday afternoon Emily complained that her knee/leg hurt were she has tumor and of course Doug and I both worried. Tonight she has complained that her right hip hurts. Again both Doug and I worry, but scans are a week away from tomorrow. Our hopes of course is that it is nothing. But as a cancer parent each body pain is scary. Yesterday I received an email from another family whose daughter has NB where they had received an email about a family whose son was diagnosed with Neuroblastoma here not far from us and if people wanted to send post cards (I am keeping this information confidential because I don't want to spread information about a family unless they would like their information out there). Doug and I were able to locate them and contacted them just to let them know that we too are a NB Family and we are here should they need anything at all, their son was at our home hospital. While I didn't hear back from them, both Doug and I thought a lot about them. Emily had clinic this morning to have her counts checked and her thyroid levels. As we suspected, Emily did need hemoglobin, because it was low. Her platelets went up by 4 to 59, while it was a small increase it was still so much better than a decrease and ANC went up a little bit, but still low. We knew the family was at the hospital, however we didn't know if they had left yet, Doug thought I should stop by and introduce myself and just let them know again that we are there should they need anything. I will be honest I tried to find any reason that I could to talk myself out of it, mostly because I was nervous...I was nervous knowing how overwhelmed that they would be with their son just being diagnosed of this fearful disease, being shy about meeting someone new, and then walking back on the 7th floor of the hospital where we have not been since June of 2011. Thanks to my husband, it was a nice gesture to introduce myself and afterwards I felt better letting a family know we are there to help when being introduced into a world of the unknown. The world of cancer is scary and there are so many unknowns. I walked onto the floor and the fear I was worried about, my nerves and everything that we had gone through on this floor overcame me, but I didn't turn around. My husband was right...while we didn't have anyone immediately to talk to about NB, eventually we did and even had texting friends that were there anytime of the day and they were amazing and very helpful, and I knew it would be helpful for them. I also knew if they didn't want to talk, that they would have asked us to leave the small gift and we would have been ok with that. The security people had not changed and they remembered me and said go ahead mom, and I had to let them know I don't have a child on the floor, I am here to visit another child, she was confused and of course I explained. Dad came out and I introduced myself nervous and the pain and fear was in dad's eyes, I could see it and the reality of what I was nervous about hit, everything that they were going through just hit me and were flashing in my head when Emily was diagnosed. Dad took me back to meet his wife, and happily I could see that they were getting ready to leave (for home after 11 days of being in a hospital hearing all the things that they never wanted to hear), but I did talk with mom for a little bit. Mom too, I could see the fear, the pain in her eyes for their son, all of everything that I remember Doug and I going through 14 months ago, which all of the sudden seemed like yesterday. Doug and I sat on that same floor for 12 days and heard those same words that they heard, it all flashed before me. For parents who never cried before, they cried before with fear and worry about their child and all of this flashed before me as I was walking back through that hallway. I was strong, because they were receptive to my coming, and I held myself together knowing that they needed me too. I saw the nurses, again most of them were the same, that were there before, nothing had changed except for other families (newly diagnosed or those I have never seen before) going through the same things that we had gone through and the fear and worry about their children. I was happy that Doug pushed me to do this, because at the end of the day, it was the right thing to do. Mom was receptive to my coming as I explained to her that I was really nervous and thought this might be too much for them, but she was glad that I was there and that she knew she would have lots of questions and asked a few while I was there. I saw their sweet little son and I just wanted to hold him as he was crying wanting his mommy (just because I remember our sweet Emily being this way), he was beautiful in all ways and all I wanted to do was say that I'm sorry and sorry doesn't even touch what they were/are and will be going through, or what we are going through or what any other cancer parent is going through. Mom and Dad I just want you to know that Doug and I there for you to help you in any way that we can, to answer any questions that you have, we are here 24/7, please don't ever hesitate. After leaving the 7th floor and getting into my van, I broke down. I broke down because I was glad that I had stopped by to introduce myself and just to let them know we were there, but also because everything that flashed in front of me. Again in the long run it felt good to be available to a family going through the unknown and going home today after 11 days thinking when they went in they wouldn't be there long and everything was ok. Please be aware that families go through this everyday and oncologists are telling parents their worst nightmares several times a day, are you aware??. Today was a day that I needed, needed to get out there (and be more open then hiding behind a computer when we want to "give back" and honestly I feel that Doug and I were able to "give back" today! Emily received her blood transfusion, and was a totally different kid, she got super blood and she had so much energy. During clinic she also had her thyroid levels checked since the MIBG treatment can cause a lot of thyroid problems. I called to see if the results were in after Emily was already gone and Elaine called back to update she said one of the levels were a little bit higher than it should be and the other was normal. She was going to check with Dr. Gowda to see if there was anything that needed to be done or just to keep a watch on it. So this will be one more thing to add to the list of worries, but we won't worry too much. We will send an email to CHOP just to have them be aware and if they think we need to do anything different. The pains that Emily has complained about here and there have us concerned, but we have to hold up hope that it is nothing and just those things that every child deals with or just something else so simple. We do leave Sunday to head to Philly! Scanxiety has surely started if not already been there with the pending scans coming up. CHOP doesn't have any plans for trials for Emily yet, we were told... "We will need to take things one step at a time in order to decide what is the next best step for Emily. Emily's next disease evaluation is a couple of weeks away and we will need to use all of the information we have at that time to make recommendations." (this was from a few weeks ago). So all we know is all the trials that we have read and what Sholler said that she could do for us, so we are waiting to see what CHOP can do for us and our sweet Emily. Platelets are no longer an issue, so we don't want to hit anymore roadblocks, we just want something that will help Emily! So the pending scans have us both a bit a nervous about what they will show and how we will move forward. February 24th, while we are in Philly, we will also be celebrating 5 years of marriage. Anything that we have to do for Emily we will do, ANYTHING, ANYWHERE! Update: I am still working on getting together care packages (bags for newly diagnosed families containing things like deodorant, shampoo and conditioner, razors, lotion, toothbrushes and toothpaste, hand sanitizer among other things to help those newly diagnosed families in the hospital) and they are coming along nicely! The stash is growing and we are excited to be "giving back"! The coupons that people are sending from all over the place, are so helpful and continue to be of huge help, so please keep them coming! Like I said the stash is coming along and I think when we come back from Philly we will be able to start working on those bags to take up to VCU for the social workers to give to newly diagnosed families. ****Donations may be made at any of those locations by giving Emily Hubbel's name and they will make sure the rest is taken care of. Make sure you hug and kiss your kids each night and tell them how much you love them! Good Night! Emily says "Happy early Valentines Day!" So, I have made a lot of updates via Facebook, so I am going to copy those and paste them here and then update the rest of the information! February 2nd: Today is day 10 after stem cell infusion and we are still waiting for her platelets to recover! Her ANC and WBC are starting to go up so we know platelets are last and longest to recover so hopefully they start to go up soon. She will be back in clinic to check! February 5th: Emily has clinic in the morning!! Tomorrow will be 14 days since her stem cell infusion, please send lots of love and thoughts for her platelets to be up and she won't need a transfusion. Dr. Sholler was looking over all of Emily's paperwork this past weekend and we have a call with her tomorrow evening! 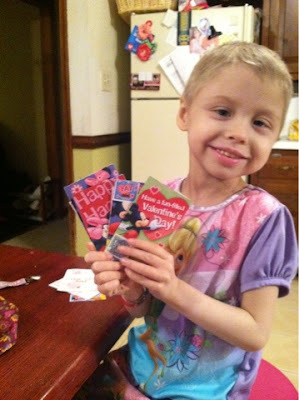 February 7th: Yesterday was the first time since we have been home from MIBG therapy that Emily did not need platelets! She was getting them twice a week and yesterday they were at 35! Anything under 20 they transfuse! This is great and we hope they continue to go up! We have clinic Thursday morning to see where things are! I hope to update more tonight! Thank you everyone!! February 8th: Emily had clinic in the morning and we will see where her counts are! Hoping that no transfusions are needed and just a quick visit! February 9th: This is our Emily with her platelets at 55 today! Do you know what that means? It means her stem cells worked and it means she will be eligible for other trials to get rid of this horrible beast NB! Woo hoo! Thankfully Emily's platelets have recovered and we have finally gotten over 55, in order to qualify for any other trials Emily has to have 50.. We finally finally feel a huge sense of relief and that we can breath again because this is what was holding us back to be eligible for anything else. We did talk with Dr Sholler on Monday evening. Sholler is an amazing woman and what I can tell you all that she has given us "HOPE" That is right, she has given us "HOPE". So from here, we have one week left at home and then on Sunday, February 18th we head to Philly to stay at the campground that we previously stayed at, where there are some amazing people there! Monday Emily will have her MIBG injection along with talking with Dr. Mattei about her pending surgery on Thursday of removing her broviac/hickman line and having the central line placed and also having her bone marrow biopsy done. Tuesday Emily has her MIBG scan done (scanxiety is already here) and then we meet with Mosse on Wednesday. Right now we are keeping everything open and taking in what trials that CHOP has to offer and also we know what Sholler has to offer us. Sholler has all of our information and insurance information, so should Emily need to go there we will. We have no idea what to expect, because we have no plans, however we can breath easier knowing that her platelets are recovering and we will have options available to us. We did have her HMA/VMA levels checked, and Dr. Gowda said there is only a small improvement from July, but its better than nothing, but they are still a bit high. These are not valid tests to go by, but it does help to see where things are. So Emily is doing great right now. She is happy, she is eating, she is going to a school on Fridays that is through the ASK Clinic from 930 to 1230 as long as her ANC stays ok, so we are happy with that. This is really quick tonight because I really just wanted to update, but I want to watch a movie with the hubby tonight. We have lots of HOPE, this is what matters. Make sure you hug and kiss your kids and tell them how much you love them.